Because I think basic psychology is the greatest impediment to thinking clearly about Book of Mormon historicity, I've created separate pages on this blog for my posts about psychology and M2C. This is a resource you can use and refer people to. You can see the pages on the upper right of the main page on your computer screen. The mobile version requires you to click on Home to see all the pages (or go to web version). 2. Frame Joseph Smith as an ignorant speculator who misled the Church, thereby keeping readers of BOMCC ignorant and confused so they cannot make informed decisions about choosing between the prophets and the scholars. The existence of ancient Hebrews in North America is not an LDS/non-LDS issue. There are plenty of people, both LDS and non-LDS, who believe, based on the evidence, that ancient Hebrews lived in North America. There are plenty of people, LDS and non-LDS, who believe an ancient civilization migrated from Ohio to western New York and vanished around 400 A.D. The evidence they rely on happens to also corroborate the teachings of LDS prophets. Of course, there are also people, both LDS and non-LDS, who reject the evidence. Evidence is not the same as proof. Proof is whatever convinces someone, and everyone has different biases they seek to confirm, which affects the threshold of evidence they require to "prove" or "disprove" a proposition. That said, there's a big difference when it comes to M2C. M2C is purely an LDS (and Community of Christ) concept, developed and promoted by a handful of intellectuals over the objection of LDS prophets. There are no non-LDS who believe there were ancient Hebrews in Mesoamerica. Plus, M2C repudiates the teachings of the LDS prophets. Book of Mormon Central Censor pretends to rely on science and evidence, but their arguments are completely unpersuasive to their academic peers, and they never tell their followers how isolated their beliefs are; i.e., they don't tell their followers that no non-LDS people believe there were ancient Hebrews in Mesoamerica. IOW, the evidence for Hebrews in North American is accepted by both LDS and non-LDS people, but the evidence for Hebrews in Mesoamerica is accepted only by a few LDS M2C advocates and their followers. No-wise #493 addresses several specific artifacts. These are not the evidences to which I referred in the previous paragraphs. In my view, these artifacts are irrelevant to the discussion, except as a distraction. I don't think they prove or disprove anything about the Book of Mormon, and the controversy over them is a gift to detractors who dispute the historicity of the Book of Mormon narrative. I think it's a mistake for anyone, pro or con, to use these artifacts to promote an agenda. That said, the approach taken by Book of Mormon Central Censor is fascinating. The case against these artifacts is not as iron-clad as they want readers to believe; they simply censor counter-arguments. Furthermore, the sources they cite, such as the Smithsonian, also refute the claims of M2C. But they don't tell their readers that, either. Not only does BOMCC censor the teachings of the prophets and the evidence that supports the prophets, but BOMCC censors the conclusions of the very sources they otherwise rely upon when those conclusions contradict M2C. The approach taken by BOMCC is the opposite of objective, scientific analysis and presentation. Naturally, we wonder, why does BOMCC continue to seek to undermine evidence from North America that supports the Book of Mormon? The fundamental premise of M2C is that the prophets are wrong about the New York Cumorah. Everyone associated with BOMCC, including their donors, necessarily agrees with this premise. Let's consider what this means. Speculative is defined as engaged in, expressing, or based on conjecture rather than knowledge and based on a guess and not on information. conjectural consideration of a matter; conjecture or surmise: a report based on speculation rather than facts. engagement in business transactions involving considerable risk but offering the chance of large gains, especially trading in commodities, stocks, etc., in the hope of profit from changes in the market price. Book of Mormon Central Censor insists that people believe Joseph was an ignorant speculator who misled the Church. The choice of the term "speculative" also imputes an element of high-risk, high-reward motivation on Joseph's part. In my view, this claim by M2C proponents is not even suggested by the historical facts, let alone demonstrated by them. The claim is outrageous, actually, but the M2C intellectuals have to persuade people to accept it or the entire M2C edifice will collapse. See Mark Alan Wright, “Joseph Smith and Native American Artifacts,” in Approaching Antiquity: Joseph and the Ancient World, edited by Lincoln H. Blumell, Matthew J. Grey, and Andrew H. Hedges (Salt Lake City and Provo, UT: Deseret Book and Religious Studies Center, Brigham Young University, 2015), 119–140. I think the no-wise citation here is wishful thinking more than an accurate summary of Brother Wright's article. Brother Wright is a great guy and a careful scholar, but he has also said he "can't unsee" Mesoamerica when he reads the Book of Mormon. He's "all-in" when it comes to M2C. Yet I don't think he makes the claim that Joseph made speculative claims. You can click on the link to read his article. He cites the Zelph incident, which those present specifically described as a revelation, not as speculation. He discusses the "ruins at Adam-Ondi-Ahman" and claims a statement not clearly attributable to Joseph was speculative. Next he discusses the anonymous articles in the 1842 Times and Seasons, which M2C advocates attribute to Joseph (an obvious misreading of history, not supported by any historical facts). Finally, he discusses the Kinderhook plates. But notice, at no point does Brother Wright discuss the Hill Cumorah in New York, either Letter VII and its multiple reproductions, nor the statements of Joseph's contemporaries on that subject. Nevertheless, no-wise #493 wants you to believe Joseph and Oliver were merely speculating about the New York Cumorah, and thereby misled their contemporaries and successors as leaders of the Church. That's what happens when intellectuals think they know more than the prophets. If you read or listen to No-wise #493, you quickly realize the No-wise is only telling one side of the story. It's true that each of these artifacts has critics who claim the artifacts are fake. But there are also others, LDS and non-LDS, who accept some of these artifacts as authentic, also based on evidence. I'm not going to revisit the debates over these artifacts because, as I said, I think the artifacts are irrelevant distractions. You can find all the arguments on the Internet if you want. But I'll relate an experience I had that influences my approach. Years ago, I spent a couple of weeks in Lebanon with an archaeologist, visiting sites throughout the country for a documentary I was filming. At one site, we purchased some "ancient" Roman coins. The archaeologist told me that usually these are fakes, but the vendors can't tell the difference so sometimes they sell authentic coins as well, because people dig them up all over the place. She examined the coins and picked out some likely candidates. I bought a handful that she recommended. I tested one of them and found it was fake. Maybe they're all fakes (I should get them all tested some day), but according to sources I've consulted, some appear to be authentic. The point is, the fakes appear real because they are copied from real artifacts. They match photos of real coins. They're well worn. It's the material composition that distinguishes between fake and real coins. A guy making fake coins who used an image of the Queen of England instead of Caesar wouldn't be able to sell his fakes. There is no incentive to create such an obvious fake. Consequently, I'm skeptical when people claim someone created an obvious fake that is not copied from a real artifact. When you read the analysis of the experts on both sides, the arguments boil down to what "should" or "should not" be present, such as an error in the Hebrew characters. Those arguments are unpersuasive to me because they are conjectural. As to specifics, there is good evidence that the Michigan tablets, at least most of them, are fakes. I accept that evidence, but I also realize not all the artifacts have been tested, and many have been destroyed. But it does not seem impossible to me that there were authentic tablets that Soper and Savage copied. The evidence regarding the Newark Holy Stones is equivocal enough to justify confirmation bias on all sides. Same with the Bat Creek Stone. I suspect the same is true of the other artifacts, but I don't care about them enough to investigate further. As I said, it doesn't matter to me whether they are authentic or fake because they are irrelevant. No-wise #493 follows the typical pattern we see in most of what Book of Mormon Central Censor publishes. In their effort so persuade people that the Book of Mormon is a Mesoamerican codex, they censor information that contradicts M2C, they repudiate the teachings of the prophets, and they apply inconsistent standards as they apply science, all while applying sophistry to confuse readers. These tactics, in my opinion, reveal the paucity of actual evidence to support M2C. When I unseal the indictment of M2C in January, this will all become much clearer. *Yes, I know Mesoamerica is technically part of North America, but M2C means a limited geography in Mesoamerica that excludes anything north of Mexico, especially the new York Cumorah. For purposes of this discussion, North America means the current U.S. and Canada, while Mesoamerica means southern Mexico and parts of Central America. No-wise #453: How Are Oliver Cowdery’s Messenger and Advocate Letters to Be Understood and Used? Today we'll look at my new all-time favorite no-wise, #453. This is the most outrageous assertion of academic arrogance published by Book of Mormon Central so far, and that's saying a lot. This no-wise demonstrates how freely and openly the M2C intellectuals repudiate the prophets, as well as how carefully they use sophistry, misdirection and censorship to confuse and mislead the Saints. NOTE: I'm writing this as a helpful insider; i.e., as someone who wants to see Book of Mormon Central (BOMC) become legitimate. So far, BOMC has engaged in pure confirmation bias, which is why it is not taken seriously be non-LDS or LDS who don't share the bias of the M2C intellectuals. It's tragic, because BOMC has raised a lot of money from Church members who have been, let's say "misled," by BOMC's claim that BOMC follows the Church's policy of neutrality on Book of Mormon geography issues. This no-wise is just the latest example of how BOMC is instead nothing but an M2C advocacy group that actively teaches people to disbelieve the prophets. Theoretically, BOMC has the potential to do so much good. My peer reviews are my effort to dislodge BOMC from its Groupthink M2C mentality that is so counterproductive and destructive of faith in the prophets and the Book of Mormon itself. Original in blue, my comments in red. [This needs to be reworded for two reasons. First, the prophets have long told us how to understand and use these letters. The letters have been reprinted multiple times in official Church publications. Portions of Letter I are canonized. Portions of Letter VII have been repeatedly taught by the prophets, and no prophet has ever repudiated or even questioned Letter VII's teaching. [This is a deceptive quotation used here to contradict the meaning of the cited source. The original sentence should be quoted in full: "Although there is no evidence that Joseph Smith assigned Cowdery to write the letters, he offered his assistance to ensure that the 'narrative may be correct.'" 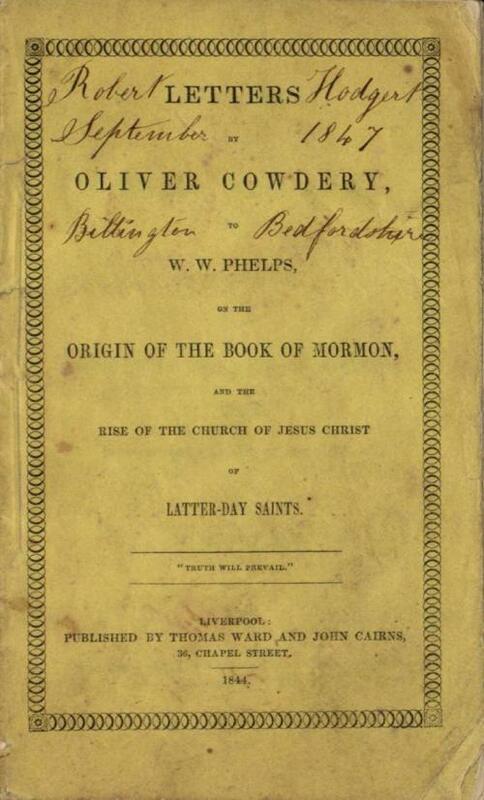 Second, the Prophet gave some support by providing Oliver details about “the time and place of [his] birth” and information about his adolescence that would help Oliver correct anti-Mormon misconceptions as a main concern,7 but it is unclear how much information Joseph supplied about other things. Third, Joseph was impressed enough with Oliver’s letters that when he commissioned his 1834–1836 history, copies of them were included. [This passive voice is deceptive, as though the letters appeared there randomly. To correctly inform readers, the following should replace this passive voice. [This is another deceptive extract from the JSP comments. The final sentence of the paragraph containing the quoted sentence suggests an important reason for copying them this way: "With the serialized Cowdery letters complete or nearing completion, the new history kept in the 'large journal' could serve as a repository--more permanent than unbound newspapers--for a copied compilation of the entire series." Even though Oliver’s history was undoubtedly popular among early Mormons, historians recognize that it does not tell the whole story and cannot be taken entirely at face value. This is not to say Oliver’s letters should be dismissed wholesale, only that they should be used carefully in historical reconstructions. While Oliver’s letters certainly convey his moving personal testimony of the authenticity of the Book of Mormon, they don’t definitively establish other matters for which there is contrary historical evidence or which remain open to discussion. This includes Book of Mormon geography. While it is true that Oliver understood the hill near Palmyra, N.Y. where Joseph retrieved the plates to be the same hill Cumorah described in the Book of Mormon where the Nephites and the Jaredites perished,22 [see comments on this footnote below] it is unknown where Oliver got this idea. 1.J. Leroy Caldwell, “Messenger and Advocate,” in Encyclopedia of Mormonism, ed. Daniel H. Ludlow (New York, NY: Macmillan, 1992), 2:892. 2.The letters can be read online at the Book of Mormon Central archive. [The footnote cites the Book of Mormon Central (BOMC) archive. While this might be useful to drive traffic to the archive, a better reference would be the archive.org version, https://archive.org/stream/latterdaysaintsm01unse#page/12, which is searchable (unlike the BOMC archive), easier to read than the BOMC archive, and lets readers see the letters in context. 3.“Letter II,” Latter Day Saints’ Messenger and Advocate 1, no. 2 (November 1834): 27–28. In October of the same year [actually, the same year and month] that Oliver began [publishing] his letters, the anti-Mormon author E. D. Howe published his highly influential work Mormonism Unvailed [sic] in nearby Painesville, Ohio. In it, Howe attempted to prove that the Book of Mormon was a modern fabrication based on a manuscript written by a certain Solomon Spalding and that Joseph Smith’s reputation, including his honesty and moral character, was suspect. Howe’s book can be accessed online at https://archive.org/details/mormonismunvaile00howe. Unlike other anti-Mormon writers, like Alexander Campbell, whom Oliver also responded to elsewhere in the Messenger and Advocate, Howe was never mentioned by name in any of Oliver’s letters to Phelps. [Naming Howe would only draw more attention to his book.] Nevertheless, the timing of the publication of Howe’s book, the considerable influence it wielded in popular discourse on Mormonism, and the overall content and focus of Oliver’s letters all make it seem very likely that Oliver was at the very least indirectly responding to Howe. On Oliver’s efforts to defend the Church, see generally John W. Welch, “Oliver Cowdery’s 1835 Response to Alexander Campbell's 1831 ‘Delusions’,”in Oliver Cowdery: Scribe, Elder, Witness, ed. John W. Welch and Larry E. Morris (Provo, UT: Neal A. Maxwell Institute for Religious Scholarship, 2006), 221–239; John W. Welch, “Oliver Cowdery as Editor, Defender, and Justice of the Peace in Kirtland,” in Days Never to Be Forgotten: Oliver Cowdery, ed. Alexander L. Baugh (Provo, UT: Religious Studies Center, Brigham Young University, 2009), 267–270. 4.See “History, circa Summer 1832,” online. 5.One year earlier, the Church’s newspaper The Evening and the Morning Star ran editorials by William Phelps on the content and message of the Book of Mormon and the early progress of Mormon missionary efforts, but these articles provided neither a substantive history behind the early life of Joseph Smith nor a clear narrative describing the coming forth of the Book of Mormon. See “The Book of Mormon,” The Evening and the Morning Star 1, no. 8 (January 1833): 56–58; “Rise and Progress of the Church of Christ,” The Evening and the Morning Star 1, no. 11 (April 1833): 83–84. On the importance of Oliver’s letters as an early Church history, see Richard Bushman, “Oliver’s Joseph,” in Days Never to Be Forgotten, 6–10.” Phelps, “The Book of Mormon,” 57, appears to be the first recorded [published] instance of the hill in New York where Joseph Smith received the plates being called Cumorah. 6.Karen Lynn Davidson et al., eds., The Joseph Smith Papers: Histories, Volume 1: Joseph Smith Histories, 1832–1844 (Salt Lake City, UT: The Church Historian’s Press, 2012), xxi. 7.Joseph Smith letter to Oliver Cowdery, “Brother O. Cowdery,” Latter Day Saints’ Messenger and Advocate 1, no. 3 (December 1834): 40. It seems very likely that Joseph provided his support in an effort to counter the accusations made in Howe’s Mormonism Unvailed. Additionally, it seems that that Oliver had access to Joseph’s 1832 history and incorporated elements of it in his sketch of Joseph Smith’s early life. See the discussion in “JS Defended Himself in Letter in Messenger and Advocate,” online; Roger Nicholson, The Cowdery Conundrum: Oliver’s Aborted Attempt to Describe Joseph Smith’s First Vision in 1834 and 1835,” Interpreter: A Journal of Mormon Scripture 8 (2014): 27–44. 8.Davidson et al., eds., The Joseph Smith Papers: Histories, Volume 1, 39. 9.Pages 46–103 of the 1834–1836 history are written in the hands of these scribes. The history can be accessed online. 10.Republications of Oliver’s letters began appearing in 1840 when Parley P. Pratt reprinted Oliver’s depiction of the visitation of Moroni to Joseph Smith. See “A Remarkable Vision,” The Latter-day Saints’ Millennial Star 1, no. 2 (June 1840): 42–44; “A Remarkable Vision,” The Latter-day Saints’ Millennial Star 1, no. 5 (September 1840): 105–109; “A Remarkable Vision,” The Latter-day Saints’ Millennial Star 1, no. 6 (October 1840): 150–154; “A Remarkable Vision,” The Latter-day Saints’ Millennial Star 1, no. 7 (November 1840): 174–178. The letters were further republished in 1840 (“Copy of a Letter written by O. Cowdery,” Times and Seasons 2, no. 1 [November 1, 1840]: 199–201; “Letter II,” Times and Seasons 2, no. 2 [November 15, 1840]: 208–212; “Letter III,” Times and Seasons2, no. 3 [December 1, 1840]: 224–225; “Letter IV,” Times and Seasons 2, no. 4 [December 15, 1840]: 240–242; Orson Pratt, A[n] Interesting Account of Several Remarkable Visions [Edinburgh: Ballantyne and Hughes, 1840], 8–12), 1841 (“Letter VI,” Times and Seasons 2, no. 11 [April 1, 1841]: 359–363; “Rise of the Church,” Times and Seasons 2, no. 12 [April 15, 1841]: 376–379; “Letter VIII,” Times and Seasons 2, no. 13 [May 1, 1841]: 390–396; “O. Cowdery’s Letters to W. W. Phelps,” Gospel Reflector 1, no. 6 [March 15, 1841]; 137–176), 1843 (“O. Cowdery’s First Letter to W. W. Phelps,” The Latter-day Saints' Millennial Star 3, no. 9 [January 1843]: 152–154), and 1844 (Letters by Oliver Cowdery, to W.W. Phelps on the Origin of the Book of Mormon and the Rise of the Church of Jesus Christ of Latter-day Saints [Liverpool: Ward and Cairns, 1844]; “O. Cowdery’s Letters to W. W. Phelps,” The Prophet 1, no. 7 [June 29, 1844]). 11.“Letter III,” Latter Day Saints’ Messenger and Advocate 1, no. 3 (December 1834): 42–43. 12.Joseph’s journal entry on November 9, 1835, which was copied by Warren Cowdery into the 1834–1836 history project, clearly recounted the 1820 vision in which Joseph saw and heard two beings. See Dean C. Jessee, “The Earliest Accounts of Joseph Smith’s First Vision,” in Opening the Heavens: Accounts of Divine Manifestation, 1820–1844, ed. John W. Welch, 2nd ed. (Provo: Brigham Young University Press, 2017), 9–12. For a recent attempt at making sense of Oliver’s omission of the 1820 vision, see Nicholson, “The Cowdery Conundrum,” 27–44. 18.See “Letter VIII,” Latter Day Saints’ Messenger and Advocate 2, no. 1 (October 1835): 197–198, where Oliver quotes Moroni for an astounding 1078 words. 19.Oliver’s overwrought verbosity, his penchant for “rhetorical flourishes” which make “the story more Oliver’s than Joseph’s,” his telltale “flowery journalese,” and his ”florid romantic language“ have been noted by careful readers. See for instance the remarks of Bushman, “Oliver’s Joseph,” 7; Arthur Henry King, The Abundance of the Heart (Salt Lake City, UT: Bookcraft, 1986), 204; Davidson et al., eds., The Joseph Smith Papers: Histories, Volume 1, 38. 20.“Last Days of Oliver Cowdery,” Deseret News (April 13, 1859)” 48. 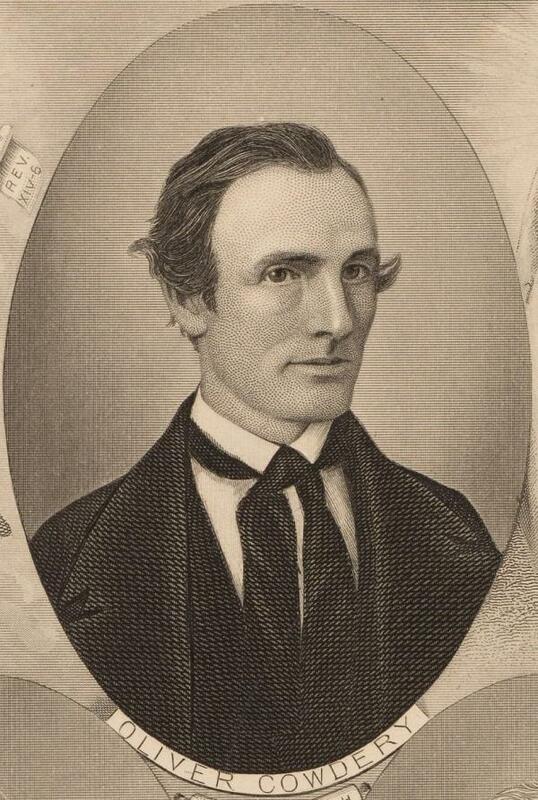 21.See Scott H. Faulring, “The Return of Oliver Cowdery,” in Oliver Cowdery, 321–362. 22.Oliver makes his views plain in “Letter VII,” Latter Day Saints’ Messenger and Advocate 1, no. 10 (July 1835): 155–159. 23.As made clear in Joseph Smith’s December 1834 letter cited above, the extent of the Prophet’s involvement with the compositions of the Messenger and Advocate letters was to provide Oliver with information about his youth and upbringing. In the absence of any corroborative evidence attesting to Joseph’s input beyond this, any comments made by Oliver in these letters concerning the geography of the Book of Mormon must therefore have been his alone. 24. "On August 17, 1835, in the midst of the Saints’ attempts to petition the government for help, Oliver Cowdery and Sidney Rigdon presented a document titled 'Declaration of Government and Law' to Church members in Kirtland, Ohio. The declaration—now Doctrine and Covenants 134—sought to address all of the Saints’ concerns." Spencer W. McBride, "Of Governments and Laws," online at history.lds.org. 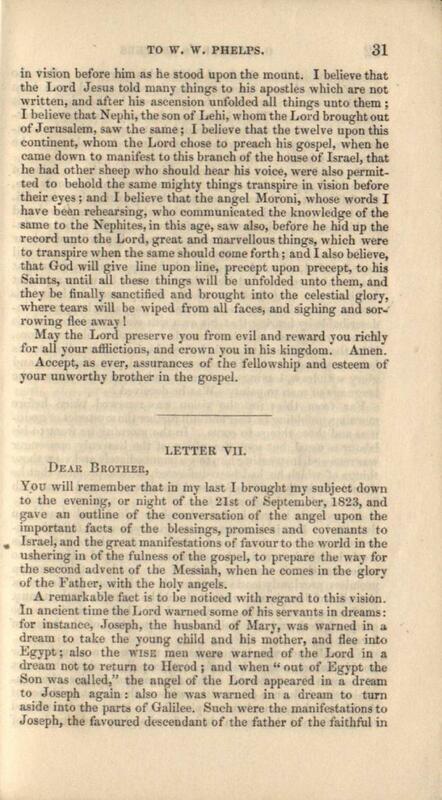 25.An excerpt from Letter I providing Oliver Cowdery's firsthand testimony of the translation of the Book of Mormon and the visitation of John the Baptist was included in the 1851 Pearl of Great Price as a footnote to republished portions of Joseph Smith's 1838 history. The Pearl of Great Price was canonized as scripture in 1880. This excerpt is present in the current 2013 edition of the Pearl of Great Price (Joseph Smith—History 1:71 footnote). Beyond this footnote reproducing part of Letter I, no material from the letters has been canonized, including any material from Letter VII concerning the location of the hill Cumorah. For the Lee citation, and additional citations showing some variance amongst Church leaders on the issue of the location of the hill Cumorah, see FairMormon’s collection of Hill Cumorah Quotes. 27.Joseph Smith himself appeared somewhat ambivalent towards the location of the hill Cumorah. In Joseph’s earliest history the “place . . . where the plates [were] deposited” goes unnamed. History, circa Summer 1832, p. 4. In his 1838 history the Prophet again merely describes the location where he found the plates as “a hill of considerable size” without positively identifying it as Cumorah. History, 1838–1856, volume A-1 [23 December 1805–30 August 1834], addendum, p. 7. Also in 1838, while describing how he obtained the Book of Mormon, Joseph spoke generally of "a hill in Manchester, Ontario County New York" as the repository of the plates, again without identifying it as Cumorah. Joseph Smith, Elders' Journal (July 1838): 43. Some 4 years later, however, in a letter dated 6 September 1842, Joseph exulted at hearing “Glad tidings from Cumorah! Moroni, An Angel from heaven, declaring the fulfilment of the prophets.” “Letter to ‘The Church of Jesus Christ of Latter Day Saints,’ 6 September 1842 [D&C 128],” p. 7. It’s conceivable that Joseph eventually accepted the identity of the hill Cumorah as being the hill in Palmyra after this theory became popular amongst early Church members. Be that as it may, it would still appear that, as with Oliver, Joseph Smith’s views on Book of Mormon geography were the product of his being informed by popular nineteenth century Mormon speculation, not revelation. See Matthew Roper, “Limited Geography and the Book of Mormon: Historical Antecedents and Early Interpretations,” FARMS Review 16, no. 2 (2004): 225–275; “Joseph Smith, Revelation, and Book of Mormon Geography,” FARMS Review 22, no. 2 (2010): 15–85; Matthew Roper, Paul J. Fields, and Atul Nepal, “Joseph Smith, the Times and Seasons, and Central American Ruins,” Journal of the Book of Mormon and Other Restoration Scripture 22, no. 2 (2013): 84–97; Neal Rappleye, “‘War of Words and Tumult of Opinions’: The Battle for Joseph Smith’s Words in Book of Mormon Geography,” Interpreter: A Journal of Mormon Scripture 11 (2014): 37–95; Matthew Roper, “John Bernhisel’s Gift to a Prophet: Incidents of Travel in Central America and the Book of Mormon,” Interpreter: A Journal of Mormon Scripture 16 (2015): 207–253; Mark Alan Wright, “Joseph Smith and Native American Artifacts,” in Approaching Antiquity: Joseph and the Ancient World, edited by Lincoln H. Blumell, Matthew J. Grey, and Andrew H. Hedges (Salt Lake City and Provo, UT: Deseret Book and Religious Studies Center, Brigham Young University, 2015), 119–140; Matthew Roper, “Joseph Smith, Central American Ruins, and the Book of Mormon,” in Approaching Antiquity, 141–162.